Long-time readers will already be familiar with this site (I’ve mentioned it/linked to it a bunch of times before), but I think the article is still worth checking out. I found some fun new posts. Yahoo Chiebukuro has become my go-to site whenever I have a question about Japanese language or culture. It may not always provide a perfect answer, but it’s generally worth a first look before deciding to dive deeper. 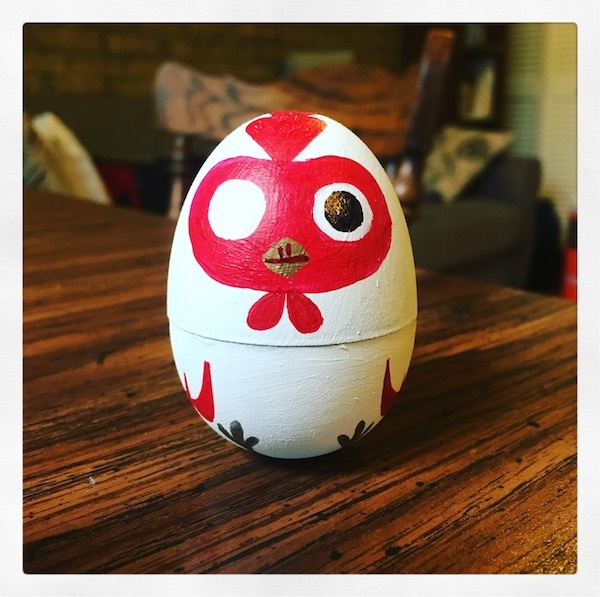 I recently filled in an eye on a Daruma a friend made for me, and I realized I didn’t know which eye to start with. As you’d expect, there’s a page on Yahoo Chiebukuro for that. It’s a little rambling but seems to imply that there are many different ways to fill in Daruma eyes, depending on what kind of wish you’re making. Sometimes you even fill in both at the same time (to maintain a connection with someone, for example), although for general wishes you start with one eye and fill in the other when the wish has come true. I wasn’t totally satisfied with the answer, so I did a little more searching and found ダルマの目はどちらから？(Daruma no me wa dochira kara? For Daruma’s eyes, which do you start with? ), which seems to have most of the same information along with a history of Daruma and how they’re used. One funny line: Daruma are associated with Zen Buddhism but can be found at shrines and all types of Buddhist temples because, the author says, 日本人はそんな原理主義的な考え方をしません (Nihonjin wa sonna genrishugi-teki na kangaekata o shimasen, Japanese don’t really have that much of a fundamentalist way of thinking). And if you read to the bottom of the article, you’ll see another interesting point: It seems some political campaigns have stopped using Daruma after disability groups complained that filling in Daruma eyes after a victory discriminates against those with vision impairments by suggesting having two eyes is superior. 2016.11.24 – How do you write ワイセツ in kanji? 2017.01.04 – Are 年男 and 年女 lucky?